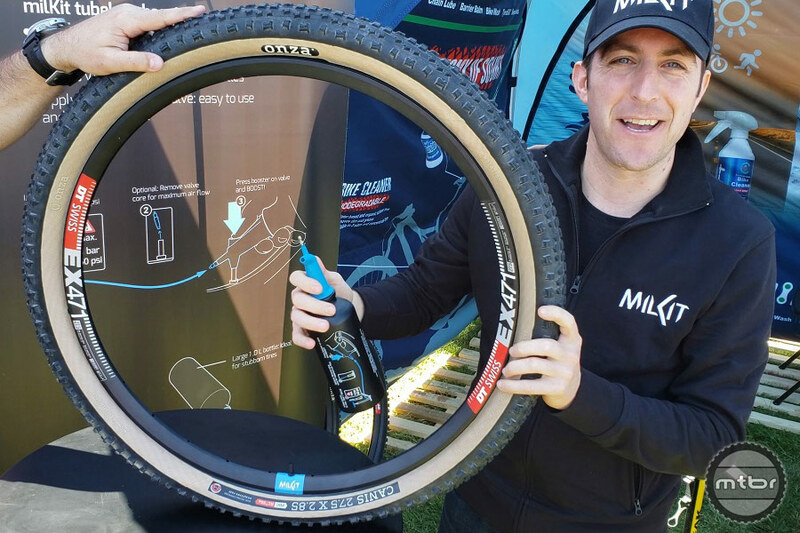 milKit co-founder Pius Kobler shows how easy it is to inflate a tubeless tire using their Booster system. 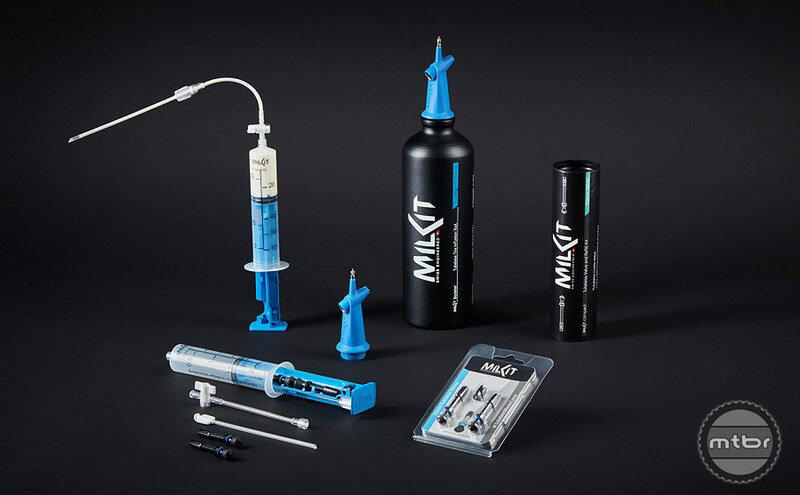 Swiss company milKit came on the scene a few years ago with their innovative approach to tubeless tire valve systems. Now they are back with their new milKit Booster. The Booster is a new spin on the tubeless tire canister idea that also doubles as a water bottle when not needed to inflate tires. It’s even sized to fit in a standard water bottle cage in the 20oz version. This can be helpful when having trouble seating a stubborn tubeless tire bead while out on the trail or for anyone who doesn’t have an air compressor in their garage. 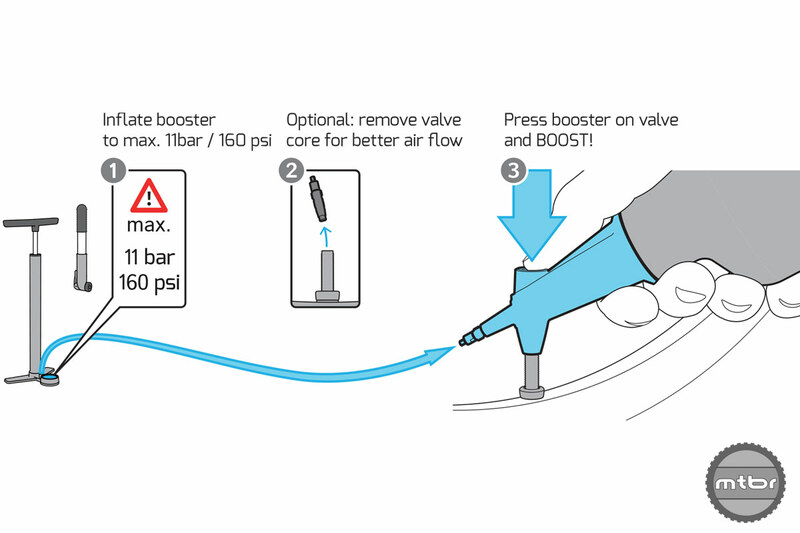 Because there are no hoses or additional valves to reduce air flow, seating a tubeless tire with the milKit Booster should be fast and efficient. The milKit Booster comes in two sizes: 1L (34oz) $50 and 0.60L (20oz) $48. It weighs 138g for the 20z Booster. For more information, visit milkit.bike. This article is part of Mtbr’s coverage of the 2018 Sea Otter Classic in Monterey, California. For more from Sea Otter CLICK HERE. milKit co-founder and CTO, Pius Kobler, showing Mtbr how easy it is to inflate a tubeless tire using the Booster system. He even pulled the Booster bottle out of a water bottle cage mounted on a bike for emphasis. 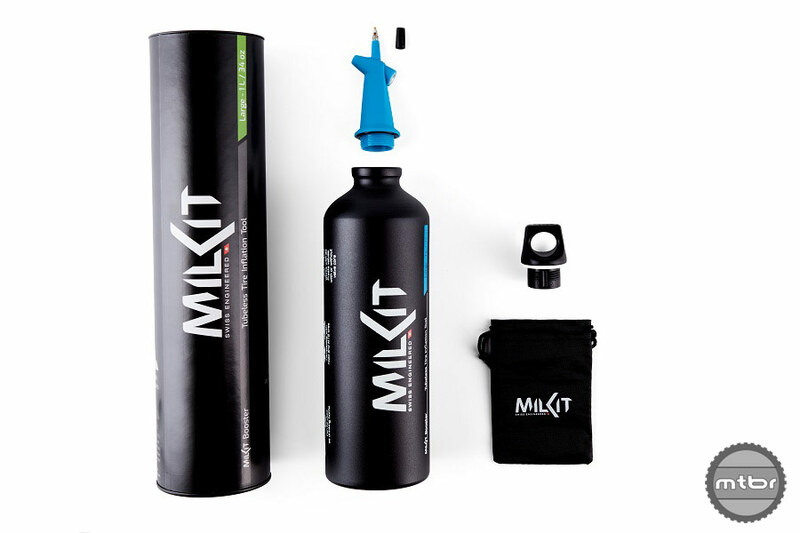 The milKit product family is designed to make using tubeless tires easier and less messy. Shown here are the Tubeless Valve System and Booster.